Patient Safety Awareness Week: how to improve communication between patients and health care providers to mitigate harm? Medical errors and adverse events are among the leading causes of death and personal injury in the U.S. According to a recent study in the Journal of Patient Safety the number of premature deaths associated with preventable harm to patients is estimated at more than 400,000 per year. Serious harm seems to be 10- to 20-fold more common than lethal harm. The patient safety awareness week is an annual campaign led by the National Patient Safety Foundation to create awareness about patient safety among healthcare providers and their patients. The campaign is running this week and the subject is “United in safety” . The emphasis is on better communication between healthcare providers and patients to reduce adverse events or medical errors. Tomorrow Wednesday March 11th at 8:30 pm ET anyone interested can join a twitter chat on patient and family engagement using #PSAWunited to participate. 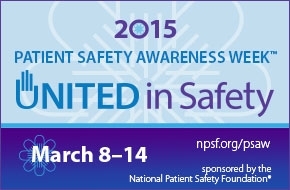 People interested can also join a free webcast on patient safety on Thursday March 12th. Many adverse drug events are preventable and constitute Medical Malpractice. An adverse drug event occurs when a patient suffers injury resulting from medication use. Adverse drug events are the results of medication errors or of known side effects that may happen even if the medication is taken correctly. According to a recent report from the Healthcare Cost and Utilization Project (HCUP) and led by Audrey J. Weiss, Ph.D. and Anne Elixhauser, Ph.D. , 380,000 to 450,000 hospitalized patients suffer preventable adverse drug events every year. According to the most recent statistics, in 2011, the most common causes of ADE during hospital stays were Steroids, Antibiotics, Opiates, Narcotics and Anticoagulants with 8 out of 1000 adults over 65 experiencing one of them while hospitalized. A surgeon can be sued for Medical Malpractice if he or she failed to properly communicate care instructions to a patient after the surgery. Recently Web M&M analyzed the case of a woman who needed arthroscopic surgery after she tore the anterior cruciate ligament (ACL) in her left knee.